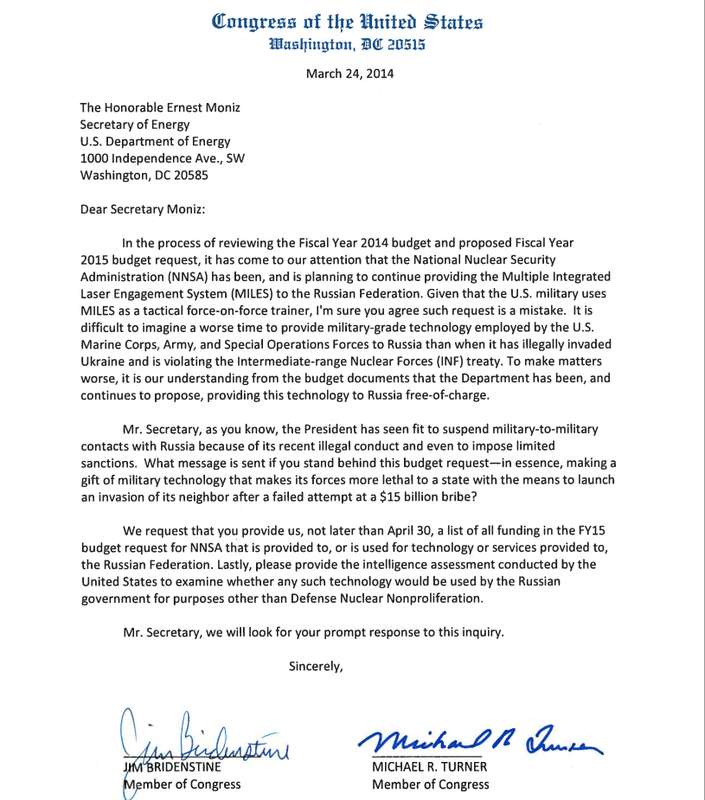 Washington, DC—Congressman Mike Turner, Chairman of the House Subcommittee on Tactical Air and Land Forces, and House Armed Services Committee Member Jim Bridenstine along with sixteen House colleagues, sent a letter to Secretary of Energy Moniz regarding the National Nuclear Security Administration’s (NNSA) FY15 proposal to provide the Russian Federation with the Multiple Integrated Laser Engagement System (MILES). Employed by the U.S. military for training purposes, the MILES is a tactical force-on-force trainer, which uses a system of lasers and dummy ammunition to simulate ground combat for soldiers. While a military-grade technology, MILES could be compared to a “laser tag” system available in some commercial markets. Both Turner and Bridenstine are concerned that the Administration’s planned supply to the Russian Federation is grave mistake given the recent invasion of Ukraine launched by Russian Federation President Vladimir Putin.